Researchers from the City University of Hong Kong (CityU), Harvard University (Cambridge, Mass. ), and Nokia Bell Labs developed a tiny on-chip lithium niobate modulator that provides faster data transmission and lower cost, which they believe will be useful as 5G communications develop. The new tiny modulator drives data at higher speeds and lower costs. Electro-optic modulators, according to a report from CityU, convert high-speed electronic signals into optical signals that can be transmitted through optical fibers. Lithium niobate modulators were problematic because they require a voltage that is significantly higher than typical CMOS (complementary metal-oxide-semiconductor) circuits provide. Scientists created a new modulator that is only 1-2 cm long with a surface area that is only one-hundredth of standard ones. It transmits data at rates of 210 Gbit/second, using less energy, and with only one-tenth of the optical losses. This new modulator fabrication technique will allow it to be placed right next to CMOS circuits, creating more integrated systems with reduced power consumption. “Electro-optic modulators translate high-speed electronic signals into the optical domain and are critical components in modern telecommunication networks and microwave-photonic systems. They are also expected to be building blocks for emerging applications such as quantum photonics and non-reciprocal optics. “All of these applications require chip-scale electro-optic modulators that operate at voltages compatible with complementary metal–oxide–semiconductor (CMOS) technology, have ultra-high electro-optic bandwidths and feature very low optical losses. Integrated modulator platforms based on materials such as silicon, indium phosphide or polymers have not yet been able to meet these requirements simultaneously because of the intrinsic limitations of the materials used. “On the other hand, lithium niobate electro-optic modulators, the workhorse of the optoelectronic industry for decades, have been challenging to integrate on-chip because of difficulties in microstructuring lithium niobate. The current generation of lithium niobate modulators are bulky, expensive, limited in bandwidth and require high drive voltages, and thus are unable to reach the full potential of the material. “Here we overcome these limitations and demonstrate monolithically integrated lithium niobate electro-optic modulators that feature a CMOS-compatible drive voltage, support data rates up to 210 gigabits per second and show an on-chip optical loss of less than 0.5 decibels. We achieve this by engineering the microwave and photonic circuits to achieve high electro-optical efficiencies, ultra-low optical losses and group-velocity matching simultaneously. 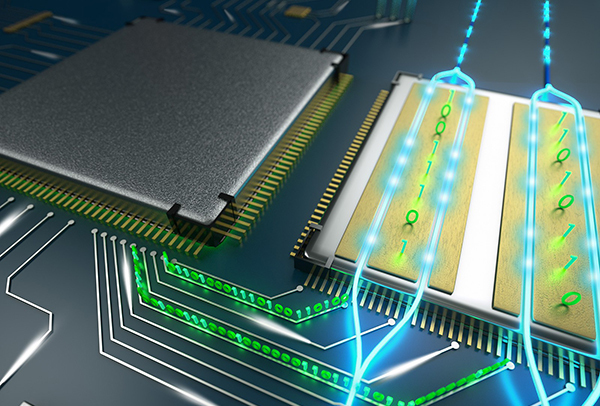 “Our scalable modulator devices could provide cost-effective, low-power and ultra-high-speed solutions for next-generation optical communication networks and microwave photonic systems.